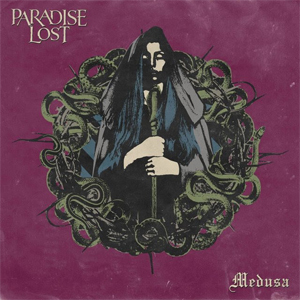 PARADISE LOST's studio album Medusa will be released on September 1st via Nuclear Blast. With this 15th full-length release, the legends are returning to their early beginnings, delivering their heaviest record of the past 15 years, melding crushing doom metal with Nick Holmes’ harsh death growls and raw organic sounds, heralding a new era of pure Northern misery. "Whilst we were writing Medusa and realizing what the new songs were becoming, we had to find an artist to reflect this direction. After searching around for a while, I found Branca Studios. They have a keen eye for design and their modern take on retro artwork really fit the bill. What they have come up with is a blending of colourful yet retro styling, whilst maintaining the classic PARADISE LOST feel." Furthermore, the band has announced a very special release show that will take place in Stuttgart at the iconic LKA Longhorn. Only on this night of September 1st, PARADISE LOST will perform their new album in its entire length - and be prepared for some more surprises during this exclusive event that will be revealed soon! Make sure to save one of the stricly limited tickets HERE in our shop.